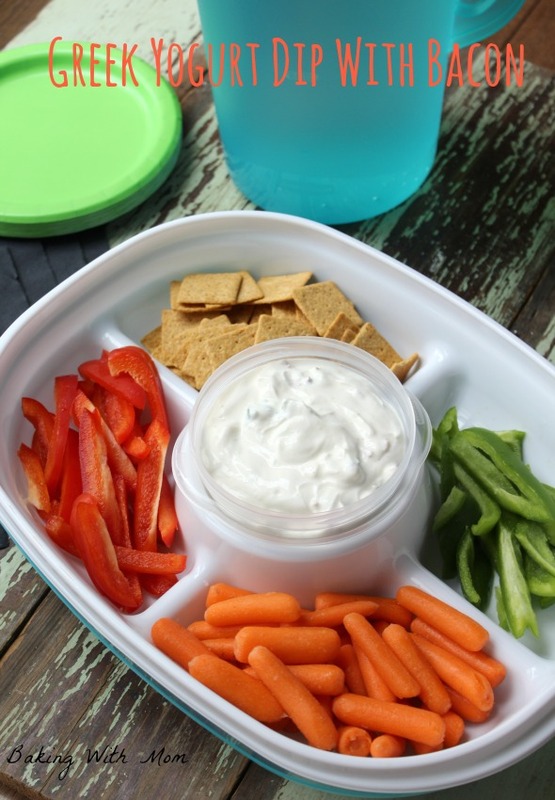 Outdoor summer gatherings made easier with Rubbermaid Party Platter. 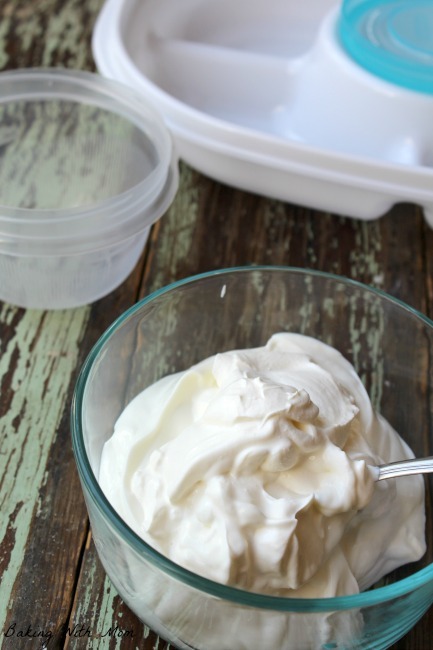 This platter is perfect for holding dips such as this Greek Yogurt Dip with Bacon. My child is graduating 8th grade. Oh, sure, some call it a promotion, and it is a promotion. I mean, they are just moving up to high school, it isn’t like he is moving out of the house. Except he has the gown. He gets to wear a graduation gown. My firstborn. Really? When did he grow up? Time flies by so quickly. They are babies, then they grow up so fast. We are having a family party for Ryan to celebrate this special day and I was putting together some pictures to display. Nothing, I say nothing, makes a mom more teary then a walk down memory lane. We have a rather large family so planning the food takes some thought. It also takes some well planned timing. 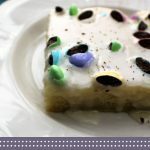 I like recipes I can make ahead of time (like Greek Yogurt Dip With Bacon) so the day of the party, I’m not so stressed. I also like it when I can find containers that help make my party planning (and hosting!) easier. The Rubbermaid Party Platter and the Rubbermaid Pitcher is perfect for the graduation. They come in fun summer colors like Calypso Coral and Lagoon Blue. 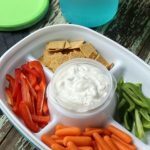 The Rubbermaid Party Platter is perfect for dips with the large divided base that keeps different types of food separated, while a smaller leak-proof inner container holds the dip and nests snuggly into the base. I went to Kroger to find the Rubbermaid Party Platter and the Rubbermaid Pitcher (available in limited edition summer colors Calypso Coral and Lagoon Blue). They also have a Rubbermaid Refill Reuse™ 20 oz Bottle available in the fun summer colors as well. These great Rubbermaid products are also available at any Kroger banner store location. They have their own display at the end of the seasonal aisle. I choose the color Lagoon Blue for the Rubbermaid containers I bought. The Rubbermaid Pitcher has a three-position lid that turns for free pouring, pouring with ice guard or closed. It also has a large, comfortable handle for easy lifting and pouring. 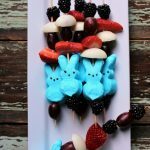 Which is perfect for guests! It is also perfect for a delicious Lime Tea or Raspberry Lemonade. 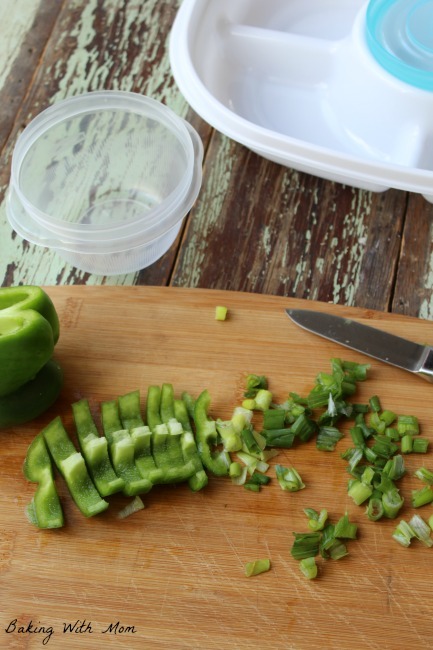 To make the Greek Yogurt Dip With Bacon, first I chopped up the green peppers and green onions. I set the onions and peppers aside, then I mixed up the plain Greek yogurt and sour cream. I then mixed in the green peppers, onions, garlic powder and ground mustard. 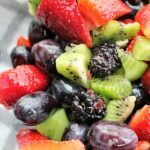 What you have is a delicious dip, perfect with veggies and crackers. The leak-proof Twist & Seal™ lid in the Rubbermaid Party Platter secures the dip and prevents spills. 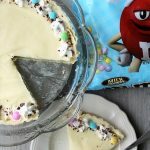 The dip can be made ahead of time and I like the Rubbermaid Party Platter comes with a secure lid that creates a tight seal and allows for safe and easy transportation. 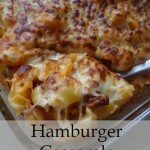 It is perfect for travel or simply carrying the dip from the fridge to the outdoors party. 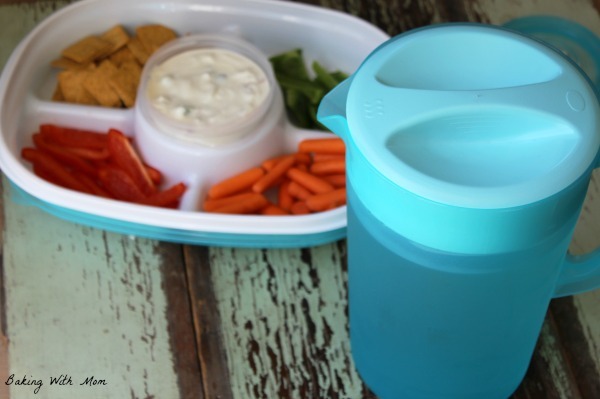 It is also BPA-free and microwave, dishwasher, and freezer safe for easy clean up and storage. The Rubbermaid containers make summertime entertaining a breeze! 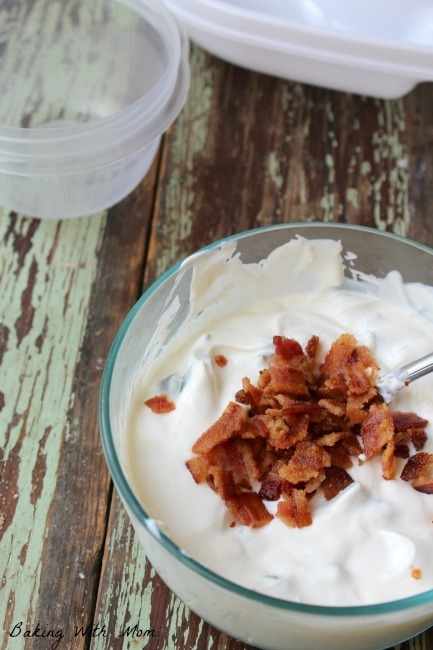 Greek Yogurt Dip With Bacon is a flavorful dip with a blend of tastes and textures. 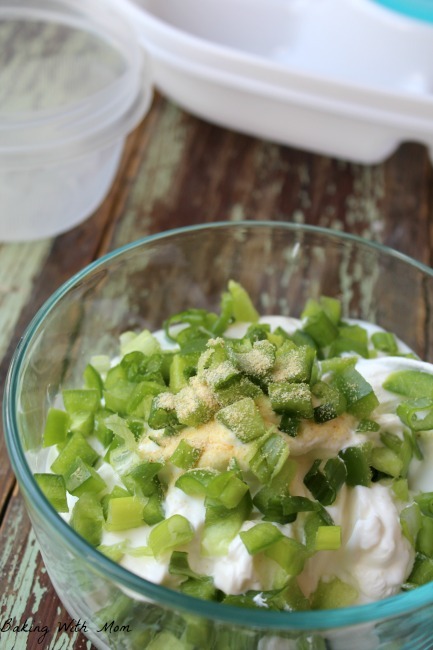 Perfect with veggies or crackers, this dip will be the hit of the party. 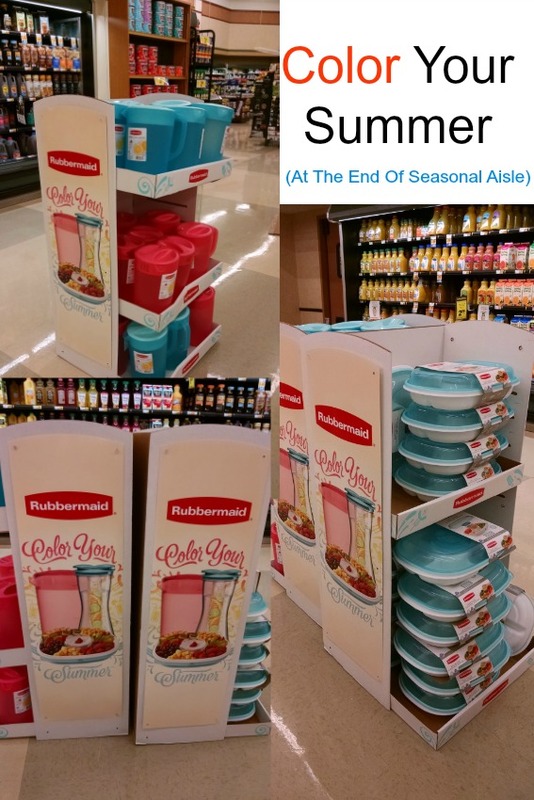 You can find more great Rubbermaid products for your summer entertaining here! You can also find the Rubbermaid on Facebook and Pinterest. Click here to save on Rubbermaid Summer Products.